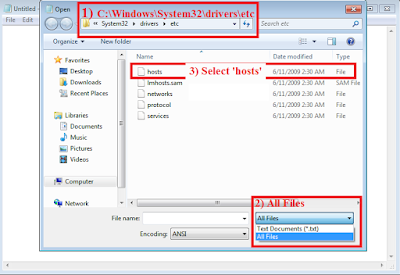 Tech-Simply: How to Edit the Host File in Windows? 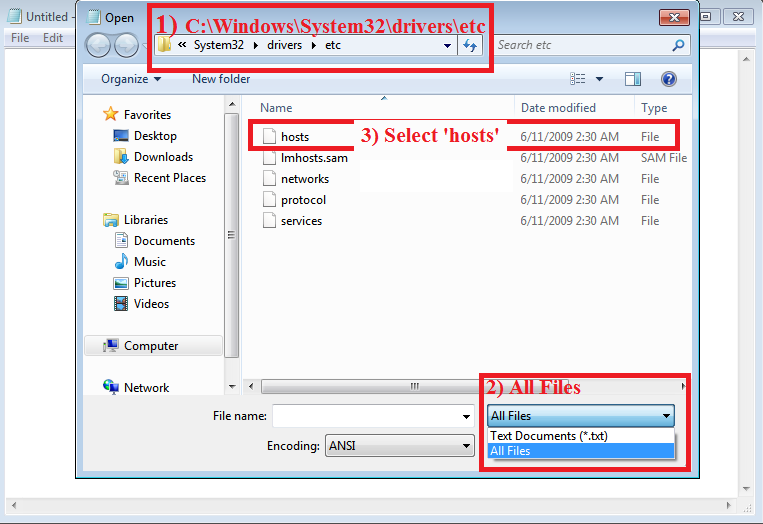 How to Edit the Host File in Windows? There's a lot one can do by making changes to the host file. Just for an example, you can block any website without using any third party software. You can boost up your internet speed by resolving the domain name to the corresponding IP Address locally at your PC, instead of a DNS Server doing that for you. So here's how to do it. Make sure that you are logged on as the administrator on the system. 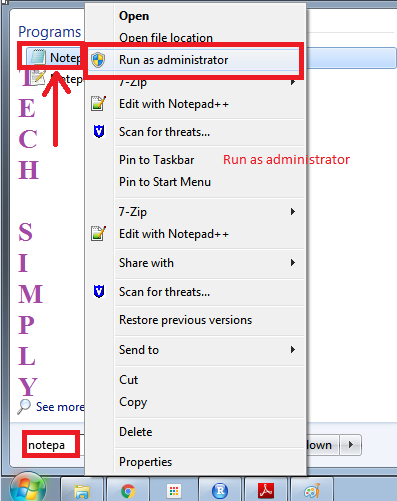 STEP-1 Search for "notepad" on your PC . 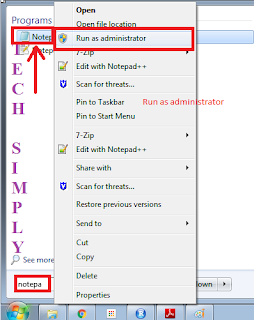 Right click on it and select "Run As Administrator". If asked, type in the administrator password, and click OK.
Also, change the file type to 'All Files' from 'Text Documents(.txt)'. Click on the hosts file. STEP 3: To block a website: Simply enter the domain name next the loop back address 127.0.0.1 in the end of the file and SAVE it by pressing Ctrl + S. A step-by-step procedure to so has been documented HERE. To resolve the domain names to IP addresses, in order to speed up browsing, make an entry of the domain name with its corresponding static IP address at the end of the hosts file and SAVE it by pressing Ctrl + S. A step-by-step procedure to so has been documented HERE.